Read all about your pet food and its ingredients. Acana dog food is made by Champion Petfoodslocated in Alberta, Canada. The company was founded in 1975 and today they say their foods can be purchased in over 60 countries. They also make a sister brand to Acana called Orijen. Both brands are super premium pet foods sold in selected pet stores and from some online sources. Orijen, in particular, is one of the most expensive dog foods available today. Known as a world-class brand of pet food, ACANA is produced by Champion Pet foods. Their mission is to establish a new standard in pet food by producing the best foods and treats possible. A Champion Pet food is a family-owned-and-operated pet food maker that has a 25-year tradition of selling quality pet foods. ACANA is a part of Champion’s mission to produce world-class pet foods from fresh regional ingredients. Acana’s philosophy is to create whole-prey diets that incorporate ideal amounts of meat, cartilage, and organs in order to be as close to a dog’s natural diet as possible. Within each formula, you will find high-quality protein sources, such as Alberta beef or wild-caught herring and flounder from North Vancouver Island. They have also substituted low-glycemic fruits and vegetables to ensure your dog is receiving all of the essential nutrients without the need for synthetic supplements. ACANA is made exclusively in the purposely-built state-of-the-art DogStar kitchens. Named for the brightest star in the earth’s sky, known to ancient cultures as the ‘heavenly wolf’, to ACANA the DogStar represents their steadfastness of purpose and their commitment to food innovation. Their brand new kitchen and manufacturing facility is located on 85 acres of beautiful farmland in Kentucky, this new facility exceeds regulatory requirements expected of human food facilities. During packaging, ACANA’s air evacuation process draws excess air from the bags prior to sealing. Depending on certain variables, some packages will appear vacuumed and others not rest assured the food in each bag will be equally fresh. 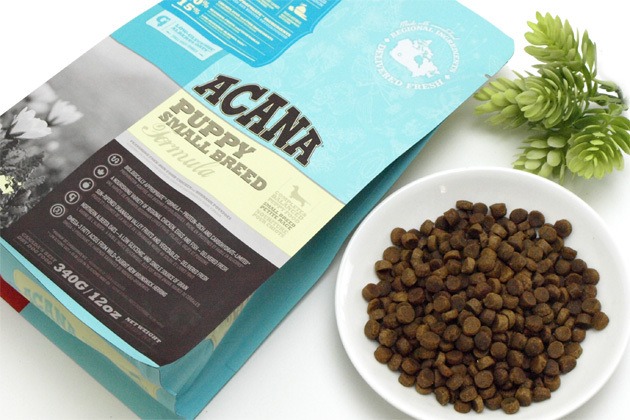 Acana is a Canadian pet food maker who produces a range of cat and dog foods from fresh, regional ingredients. Their foods are designed to mirror the fresh and whole meats that dogs and cats would encounter in their natural environment, and are rich in protein and low in carbohydrates. They include fresh meat and fish that are delivered fresh each day, and are free of preservatives. ACANA Heritage foods are rich in protein, low in carbohydrates and feature 60% inclusions of free-run poultry freshwater fish or heritage meat. Deboned Beef, Deboned Pork, Beef Meal, Whole Green Peas, Red Lentils, Pinto Beans, Pork Meal, Beef Fat, Chickpeas, Green Lentils, Whole Yellow Peas, Deboned Lamb, Herring Oil, Sun-Cured Alfalfa, Natural Pork Flavor, Beef Tripe, Beef Liver, Beef Kidney, Pork Liver, Pork Kidney, Pork Cartilage, Lamb Tripe, Lamb Liver, Lamb Kidney, Dried Kelp, Whole Pumpkin, Whole Butternut Squash, Kale, Spinach, Mustard Greens, Collard Greens, Turnip Greens, Carrots, Apples, Pears, Freeze-Dried Beef Liver, Freeze-Dried Pork Liver, Freeze-Dried Lamb Liver, Zinc Proteinate, Mixed Tocopherols (Preservative), Chicory Root, Turmeric, Sarsaparilla Root, Althea Root, Rose Hips, Juniper Berries, Dried Lactobacillus Acidophilus, Dried Bifidobacterium Animalis Fermentation Product, Dried Lactobacillus Casei Fermentation Product. Acana dog food prices range from $2.99-$5.99 normally. The prices vary according to the food weight. As Acana Sport & Agility Dog Food is available in 11.4 kg (25 lbs.) bag and its price is $65.99. Acana Dog Food is a moderate-protein, low-carbohydrate and grain-free, biologically appropriate diet with a ratio of 60 percent premium animal ingredients; 40 percent fruit and vegetables; and zero grains. Acana features human-grade ingredients, we don’t recommend anything less, so you aren’t going to find any of the questionably sourced rendered meats or waste and by-products of the human food industry that are so common in commercial dog foods today. The meats used are never frozen and contain no preservatives. Unlike most commercial pet foods, the fresh regional meats used in Acana Dog Food are processed the same day they are received, and are a key factor in the superior palatability and feeding performance of Acana. Acana Dog Food provides a superior kibble diet for your canine companion, rich in real meat protein, at an affordable price. The only real competition comes from its sister food, Orijen, and you can’t go wrong with either one. Orijen has higher meat protein content than Acana. Orijen dog food is made with 75 to 80 percent meat, while Acana dog food is made with 40 to 65 percent meat, depending on the specific formula. Orijen dog food formulas have between 38 and 42 percent protein, while Acana dog food formulas contain protein levels in the 27 to 34 percent range. There is also a difference between Orijen dog food and Acana dog food with regard to carbohydrate levels. Orijen dog food formulas range from 18 to 22 percent carbohydrate while, Acana dog food formulas are generally in the 28 to 30 percent carbohydrate range. With regard to the amount of fresh meat, Orijen dog food is made with up to 40 percent fresh meats, compared to Acana dog food, which generally has from 9 to 15 percent fresh meats. There is also a difference in fresh meat variety. Orijen dog food contains at least five fresh meats, whereas Acana dog food contains three fresh meat ingredients. Because of these small differences, Acana is priced slightly lower and is more affordable for some pet owners. But the quality of the ingredients is the same.